Monitoring nutrient performance through a range of metrics or indicators is essential to assess changes over time. These metrics need to be described in terms of the system boundary, the time scale used and the sources of the raw data used. For broad scale nutrient use efficiency and effectiveness estimates, only PNB or PFP are easily derived and provide some useful information, but neither are complete productivity or environmental indicators. The most appropriate performance indicator terms depend on the context in which they are to be applied. For regional nutrient risk assessments, a PNB will be of use, whereas to assess the effectiveness of nutrient use for food production PFP will be useful. Neither metric assesses environmental fate, as loss pathways may – or may not – be environmentally benign and a better assessment is made when these are linked to measures of soil fertility. Similarly monitoring and reporting of the use of 4R practices can complement the reporting of nutrient performance, but additional practices and additional indicators are necessary to reflect the full range of social, economic and environmental impacts. Improved nutrient-use efficiency, especially for N and P, will be a cornerstone of future farming systems and will require a range of approaches and techniques as no single method will provide increases in all situations and across all crops. There is merit in the judicious use of enhanced-efficiency fertilizers using the 4R principles to ensure nutrient supply matches plant demand, so minimizing losses. Tools for meeting the source-rate-time-place optimum include better soil tests and crop monitoring to match nutrient demand and supply on a site-specific basis. 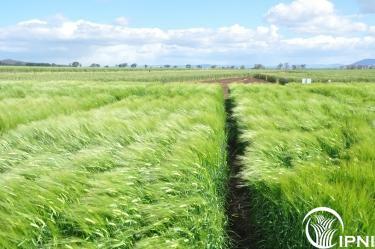 As well, the development of nutrient-use-efficient crops using conventional and novel plant breeding methods will deliver improvements in the short to medium term. A full copy of the paper and presentation may be accessed below.